Get It Together! 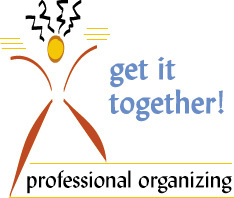 is a professional organizing business that specializes in home, office, and computer organizing. We believe in creating peace of mind by clearing clutter. been organized my whole life and enjoyed helping my family and friends to organize their homes. I found that at every job I worked at I was helping these companies to stay organized. I was also finding new ways for these companies to be more efficient. That is when I decided to start Get It Together! I wanted to provide a service that would help others become organized. By being organized, you experience a calmness and relief that translates into a more fullfilling life. At Get It Together! we want to help you accomplish your goals and “to do” lists. We can provide information for hands on solutions that will increase your productivity, reduce stress, and lead to more control over time, space and activities. I find that helping people to achieve order and success in their lives is very satisfying and rewarding. All of our services are client – tailored and can be a one – time session or continuing assistance. We provide several services to help you clear out the clutter and to organize your life! You can visit our website at www.organizingguru.com and www.help-organize-life.com.